The present book on "Scaling Measurement and Statistical Tools for Extension Workers"is very useful for researcher and to build good managerial skills. The book includes many variables, measuring techniques, scales and test with statistical tools have been compiled by the authors which are useful for social science research methodology.Topics in the book are organized mannerly and divided in various relevant sections. The topics covered in every section are general as well as specific in nature and related to measurement of variables and commonly used statistical tools. These include number of procedures for measurement of the variables, categorization procedures, scale construction procedures and techniques of data processing for qualitative as well as quantitative data. The book also supports the easy learning of individual for their quality research work.We have no doubt that book material will be immensely helpful to the extension workers, students as well as researchers. Regarding the organization, the book consists of four sections, well arranged in coherent manner. Section I includes measurement of variables viz., Personal Variables, Social Variables, Economic Variables, Agronomic Variables, Situational and Communicational Variables and Psychological Variables. Section II includes various attitude scales developed by various researchers which will be useful to new researchers to use these scales in their research for fruitful results. Section III includes some other scales by research scientist. Section IV includes various statistical tools like descriptive statistics, tests of significance, correlation and regression analysis and categorization of variables which is commonly used by extension workers. This section explains the analysis using these statistical tools in MSExcel and SPSS software. It is elaborated in very easy language to understand by the beginners. 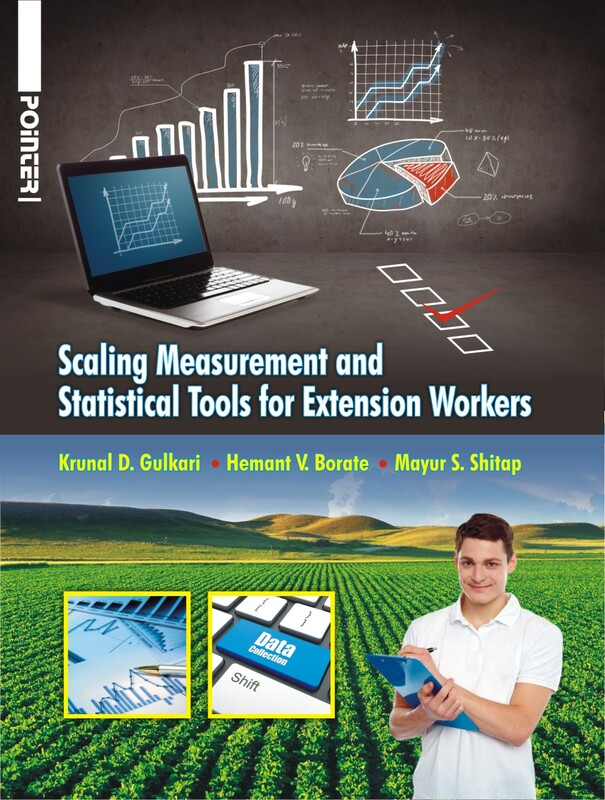 The present book on “Scaling Measurement and Statistical Tools for Extension Workers” has been specifically addressed to the needs of extension personnel. The compiled content will be of great use to the researchers, students of extension and allied department which will result in providing rich output.